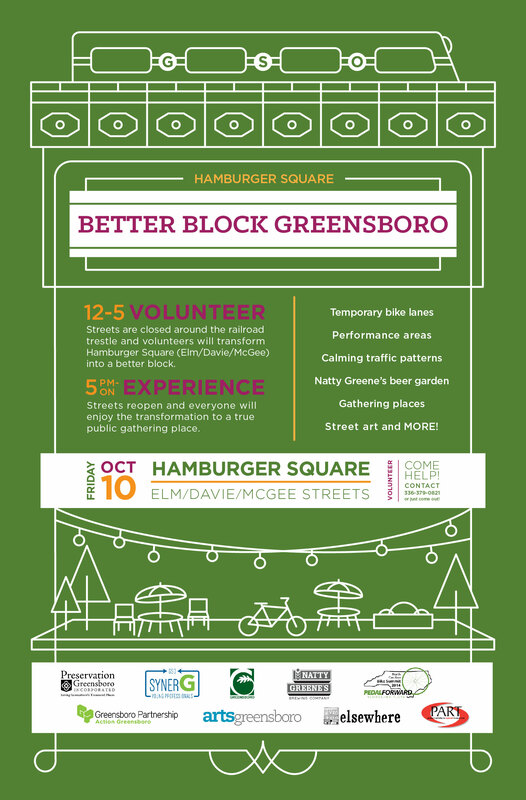 On Friday, Oct. 10, from 5 to 9 p.m. ArtsGreensboro, Action Greensboro, NC Bike Summit, PART plus others are working on a demonstration project in Hamburger Square, downtown next to Natty Greene’s. 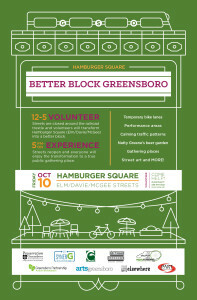 The event is called Better Block Greensboro. The goal is to transform the area at McGee/Elm/Davie/MLK into a true public square, activating the grassy areas and calming traffic movement. They will test a number of ideas that could be incorporated into more permanent streetscape improvements and public art. The group wants to illustrate the value of more permanent locations where planned and unplanned music and dance performance could occur in downtown/Hamburger Square by introducing movable seating and trying out some temporary stages. The Hamburger Square area should always be inviting for buskers and other performances, rather than sitting as a sleepy gap in the middle of South Elm Street! This free event is relevant to our College Hill efforts. College Hill Joe Wheby will be assisting Preservation Greensboro with their display at the Cascade Saloon, so stop by and say hi! This entry was posted in Events, McGee Street. Bookmark the permalink.